Reverse Osmosis is the reversal of the natural osmosis process. This process is used to desalinate aqueous solutions. Using suitable high-performance membranes it is possible today to remove more than 99 % of all salts from an aquaeous solution. Reverse Osmosis is sometimes referred to as ultrafiltration because it involves the movement of water through a membrane as shown in Figure 1. The membrane has microscopic openings that allow water molecules, but not larger compounds, to pass through. Some RO membranes also have an electrical charge that helps in rejecting some chemicals at the membrane surface. Proper maintenance is essential to retain effectiveness over time. 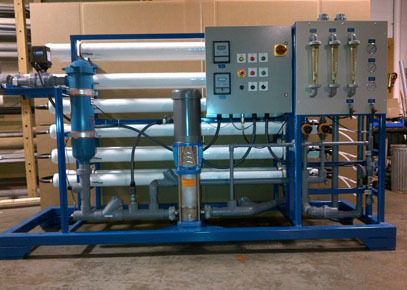 Some units are equipped with automatic membrane flushing systems to clean the membrane.